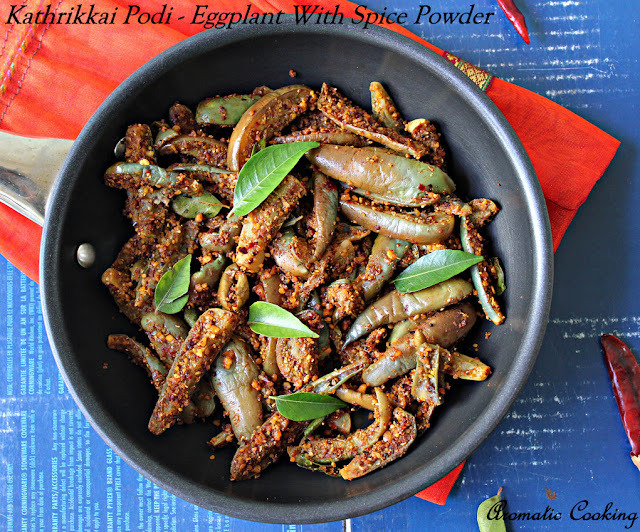 Kathirikkai Podi Potta Curry, this is one of my favorite curries using brinjals/eggplants. 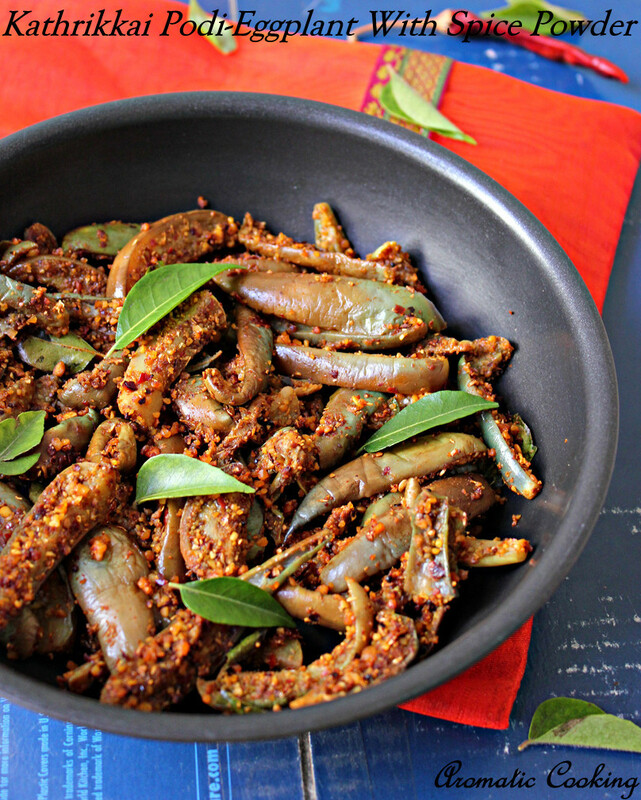 This curry comes out best when done with tender baby eggplants, which holds it shape and doesn't turn mushy when cooked. I have also done this curry with the Chinese eggplants, the long and slim ones, the curry tasted good but these brinjals turned a little too soft. 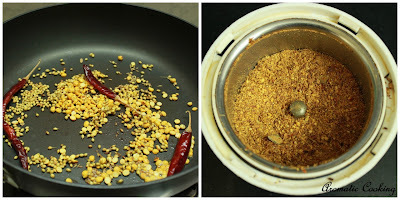 It gets its flavor from the freshly ground spice powder/podi added to it and goes well with rice and dal..
Roast all the ingredients given under 'roast and grind' and make a slightly coarse powder with it. 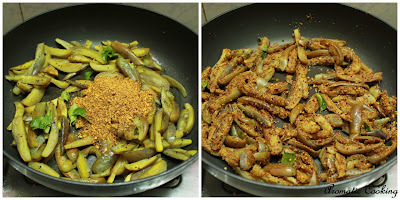 Heat some oil, add the mustard seeds, once it starts spluttering, ad the brinjal pieces along with the turmeric powder and salt and asafoetida. Mix, cover and cook for about 5 minutes, the vegetable should be done but still hold its shape. Now add the spice powder, mix and a little oil around, and keep mixing carefully for about 2 minutes. Finally add the curry leaves, mix for a minute, remove and serve warm. Very tender brinjals cook in 5 minutes, some may take a little longer, upto about 10 minutes. Cook on low heat, don't add water. 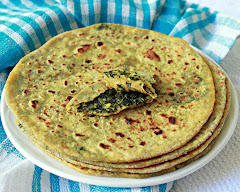 I have used the thin, small ones available here in India, if you get the fat baby eggplants, then slice them into 6 to 8 pieces. New recipe to me ....Looks perfect. Love the clicks Hema !!! 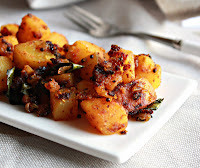 Podi potta kathrikai epavumae thanni taste thaan. You have got it perfect. One of my favourite veggie..yummy stir fry Hema! Love this podi curry, makes me drool. 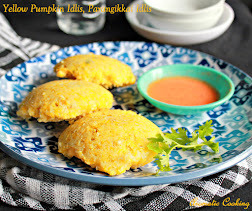 Delicious kathriakkai podi curry I too make eggplant with mulagapodi. 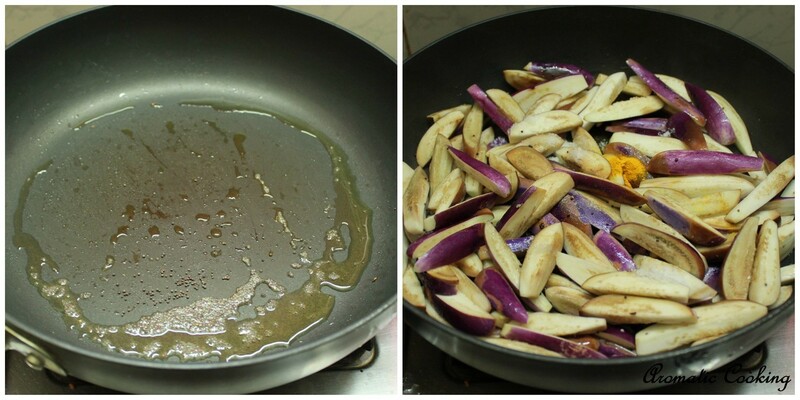 Love this method of preparation.. My mom sometimes makes eggplant this way..
new recipe for me..looks delicious!! 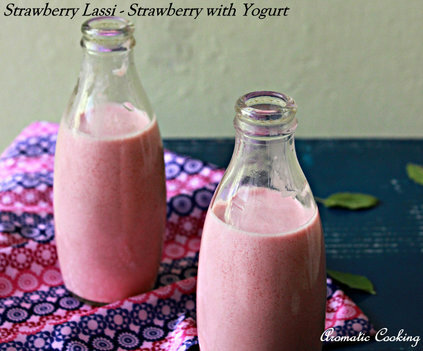 will try it soon!!! wow..love the aromatic spice flavors in there,yummy!! 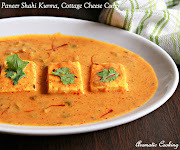 wow looking so nice,,i am feeling hungry.....this one of my fav recipe to cook and eat....lovely presentation....and clicks..